- Compact size, big wisdom: Its size is the same as a smart phone, but it has many interfaces. - New generation American Bridgelux LED light, power consumption is 10-24w. - Environmental protection & energy-saving, more than 20000 hours' lifetime, harmless to eyes. - A good assistant for children education at home, also an attractive toy for kids. 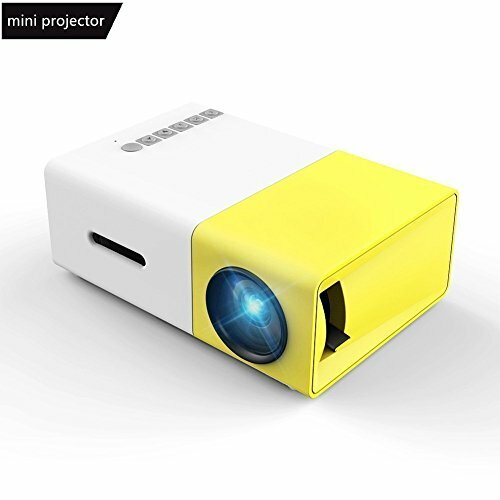 SMALL & COMPACT: This pocket size projector is only 4.7"x3.4"x1.9" (10.25 ozs), not much bigger than your smart phone. You can take it an-ywhere in your purse, pack or pocket. Ideal for home entertainment in a dark room, not recommended for Power Point or business presentations. POWERED BY A POWER BANK: The projector does not have its own battery, it needs a 5V/2A power source such as a wall charger or power bank. Great for travel, hiking and camping where there's no electricity or TV. Also popular with children. PERFORMANCE: 400 Lumens; Native resolution:320x240 pixels; Sup-port resolution:1080P; Aspect ratio: 4:3 or 16:9; Projection distance: 1-3m; Projection size up to 60 inches. WARRANTY: 12-month warranty and professional customer service support. If you have problems with the projector, please contact us. If you have any questions about this product by Meer, contact us by completing and submitting the form below. If you are looking for a specif part number, please include it with your message.